Good-quality light fixtures are well worth the money spent as they will provide years, even decades of faithful service. But a single, good fresnel light head, stand, doors, etc. can easily run several hundred dollars. Then, to get creative, you still need an external dimmer, and several colored gels to craft the light into something more creative. Alternatively, LED panels have been gaining popularity for energy efficiency and cool running. 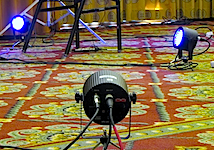 Looking beyond the small set of white and bi-color LEDs specifically made for video production, you can find a whole other world of LED fixtures made for other markets–including “disc jockey” LED lights and controllers. For the cost of one good fresnel light, you can have a multi-light, expandable LED lighting package. Read more at Streaming Media Producer.